This binder is beautifully constructed, heavily embossed, and assembled by hand. The exterior art is by Michael O'Neill McGrath, OSFS. The water of baptism mingles with wheat and grapes as they move toward the center of the cross and meet with the circular movement of the Spirit. Perfect for presiders, cantors and lectors, as well as for accompanists to use to assemble each week's service music. Also functions beautifully as an expandable alternative for enrollment or remembrance books. Use for general intercessions, announcements, special rites, and seasonal service programs. Ideal for Choir or general use. 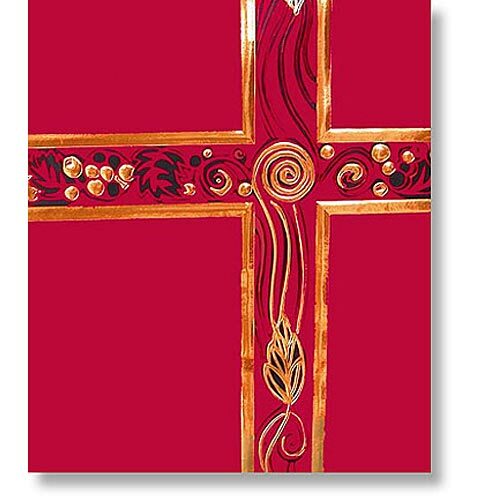 For use on Palm/Passion Sunday, Good Friday, Pentecost, and feasts of martyrs and apostles.